Since lately I’ve been posting haphazardly, with most posts hanging without an ending, and the words “to be continued ….” rather misleading and somewhat abused, I pledge to conclude all the infamous sagas, before starting anew. Good. With that out of my chest, let’s backtrack slightly to the Moussandra post and move on from there, shall we? Since the last visit to Tony Roma’s was sometime during the Jurassic age (ie : when they opened their 1st outlet in Pavilion, and offering ‘cheap’ set lunches from RM16.90 onwards), I proposed (no, not THAT form of proposing) to have dinner at Tony Roma’s over at Pavilion, again. Of course, I can’t be selfish since the other 4 pretties (loosely used term, this one) have not stepped into the joint yet. I still remember my 1st visit to Tony Roma’s back then. The service was chaotic, the staff who was on duty to usher the patrons was rather lost in the cloud, walking behind us, instead of showing us to our seats. And no, she was not helping and left us wandering all over before settling down on a table closest to us. Hmm. But surprisingly, she’s improved, by leaps and bounds (again, another loosely-used term here) this time around. Yup, she’s still there, better than ever! (I’m hopeless here) Of course, her performance scored higher marks when paired with not one, not two, not three, but a WHOLE LOTTA usherers welcoming us at the door! I felt as though the red carpet was awaiting to be rolled out and ‘kompang‘ to be sounded any minute then! But of course, I was being hopeful, and delusional. But they sure were cheery that evening! We started off with half an onion loaf, which was suitably greasy enough to be indulging, yet tasty at the same time, especially when dipped into the accompanying BBQ sauce. But a little soggy, when ideally the rings should have been crispy. Half a loaf would do the trick, thus don’t go overboard if you’re not fond of fried, and filling starters. 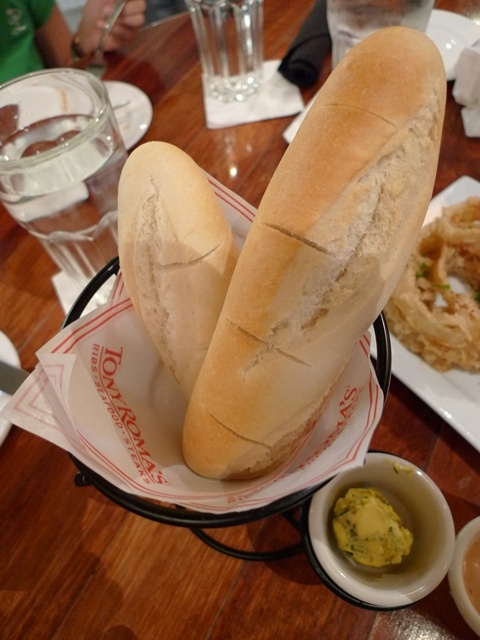 Their serving of bread which resembled baguette was soft and fluffy when warm, but turned hard rather fast. Highly advisable to eat them while they’re still warm. The portions at Tony Roma’s are HUGE. Just like any other American diners out there, eg. Friday’s and Chili’s. Definitely meant for sharing for light eaters. If the meats don’t stuff the hell outta you, the accompanying fries definitely would! But do take note that the serving will be downsized considerably if you’re ordering their set lunches. Understandable, as the sets come with other bells and whistles (soup, and desserts), and at rather reasonable prices. 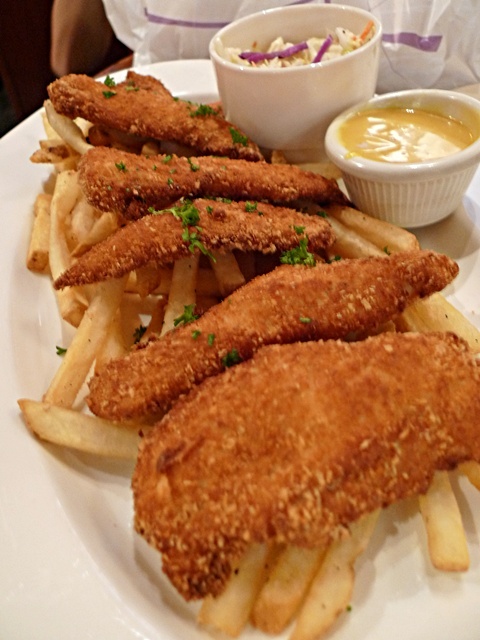 The chicken tenderloin platter came in a shocking serving of FIVE pieces of palm-sized batter-fried chicken meat. With tonnes of fries (with hints of skins; a good sign as they’re not using the average shoestrings from the supermarket), a bowl of coleslaw to balance out the cholesterol (haha .. as if) and a dipping sauce of honey mustard. Though from the appearance the meat looked dry and bland, they were pleasantly juicy, and crispy at the same time. If only they offer a half portion instead ….. 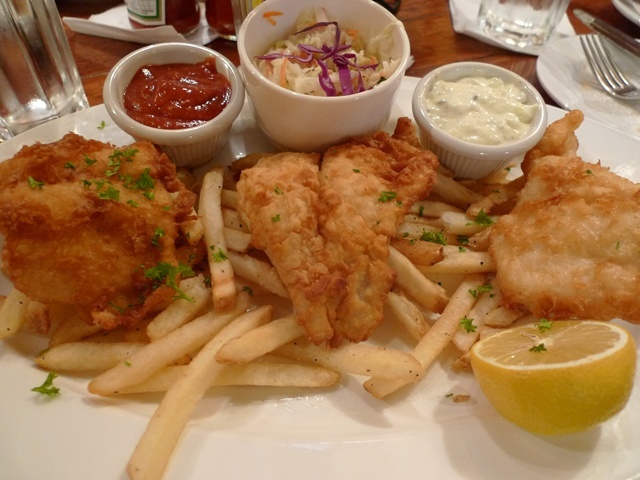 The Fish & Chips was equally good, though far from spectacular. With half a wedge of lemon, and the compulsory mayo and chilli (or was it tomato?) sauce. 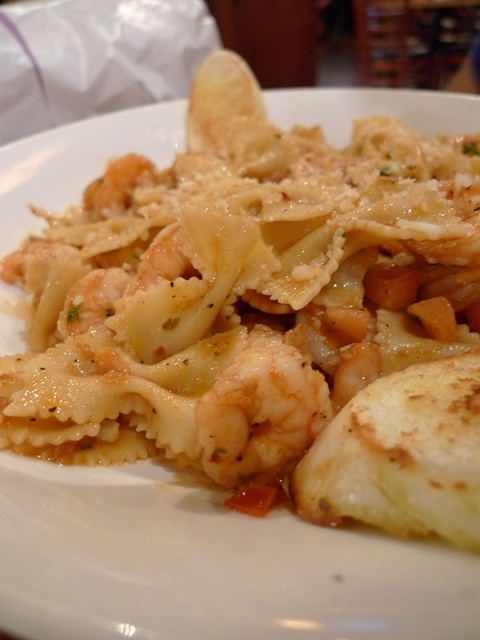 The shrimp scampi pasta (real name forgotten, sorry!) arrived in its splendour, with more shrimps thrown in than one could count! They were really generous with their ingredients, and not mere small, frozen shrimps, but succulent, M-sized ones were served. But of course, Tony Roma’s famous for their ribs. No, not the staff’s, but the grilled ones. Though the outlets in Malaysia are branded HALAL, thus no pork ribs are served. Only beef, which surprisingly managed to irk most of the foodies over here, given the fact that the pork version has garnered quite a following in neighbouring countries. The beef ribs can be served in two ways. Full rack, or Roma rack. 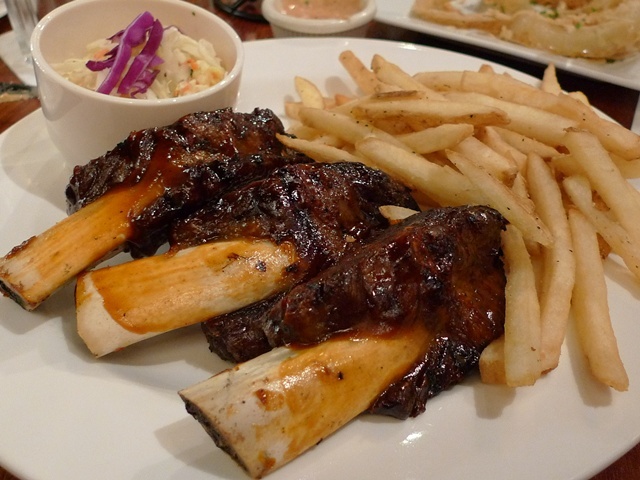 The latter came in smaller portion, 3 gigantic pieces of Char-grilled ‘Carnivorous’-wet-dreams-come-true’ beef ribs, smothered with their signature sweet and smoky BBQ sauce, and served with plentiful of fries and coleslaw. Tastewise? The tender meat falling off the bone? Checked. Hunger pangs satiated? Checked. Carnivorous appetite appeased? Checked. Juicy and succulent flesh? Checked. Wait, make that half-checked. Though the meat was far from dry, they could’ve smothered the ribs with more sauce, OR provided a side serving of the BBQ sauce, to ‘moisten‘ the meat, so to speak. 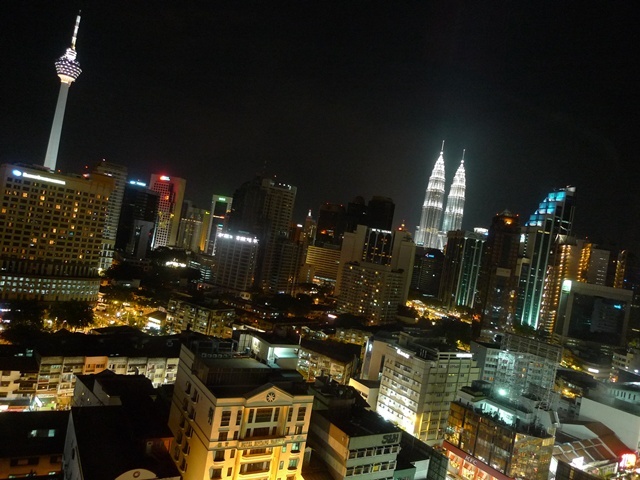 Imagine lying on one’s bed, with a almost picture perfect view of KL’s skyline. Enlightened? 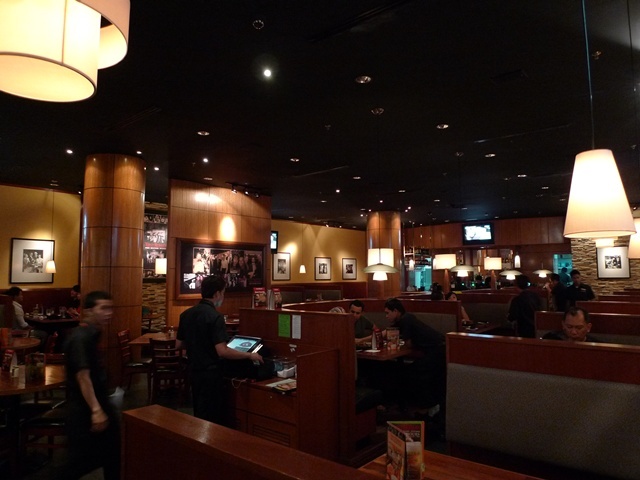 Location : Tony Roma’s Ribs, Seafood, Steaks Restaurant @ Lot No LG1.15, Level 1, Pavilion Kuala Lumpur, 168, Jalan Bukit Bintang, 55100 Kuala Lumpur. Tel No : 603-2143 3378. 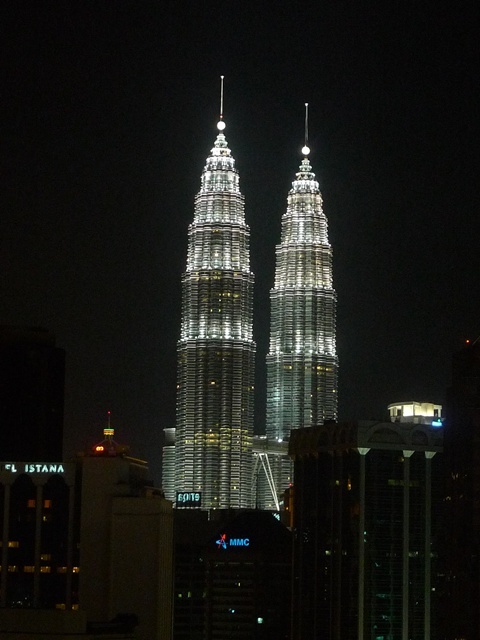 KLCC – Still the tallest TWIN buildings in the world. Boleh eh? A short note : The journey by train from KL Sentral to Ipoh takes approximately 3 hours. Yup, right on time, no delays or other nonsense. No pestering from hawkers selling their ‘kuih-muih’ on board, but instead the staff from the cafeteria in the train will push their cart ala flight attendants. And they even showed Harry Potter (forgot which chapter though) on the LCD screen throughout the journey. Not bad, considering I paid a mere RM18 for the one-way trip. Go to www.ktmb.com.my for more information. & i'm the KTM supporter!haha! hey..back from north?post something good ya! ya..considering i’m a small eater at times…depending on my moody stomach…my meal was definitely a large portion..but thanks to u guys..i’ve distributed my pieces of chicken so didn’t have to stuff them down my throat! frm april 2009,the trains at 1pm and 5pm make only 6 stops..so out journey to kl becomes even shorter..say abt 2hrs 30 mins!cool! now can’t wait for the electric train! Tony Roma! Heard so much about it, but yet hv chance to try it out! The ribs make me salivating! rif and I always eat the onion loaf – WHOLE! It’s so good that half a loaf won’t do! Onion loaf, first time seen it besides trying it. Last time I tried at Pavilion, they were also chaotic, still no improvement? Your pics of KL twin and tower very enlightening indeed. You gotta try the honey baby ribs… that’s so good!!! Walio! so delicious dishes and so well pick! I just love those ribs but i hope I will get to taste their pork ribs when I am at their other outlet outside Malaysia. they didnt giv u the bottled sauces meh??? haha i liked how u abt just covered urself on every sentence, just in case some1 misunderstood ur proposing to the 4 pretties haha..
sc : oh ya! Cagayan! the one in Bandar Utama right? ok ok … got it. Suwei : yeah, they must be thinking, hmmm, Malaysians need to really bulk up, like their counterparts from the States! FCOE : wah, a diehard fan eh? you can ask for VIP card liao. shorten to 2.5 hours? sure better choice than the buses. allie : what you waiting for? 🙂 since they’ve outlets in major shopping complexes, you’re bound to bump into one someday. in KL that is. Bangsar babe : that day the Onion Loaf was so so only. 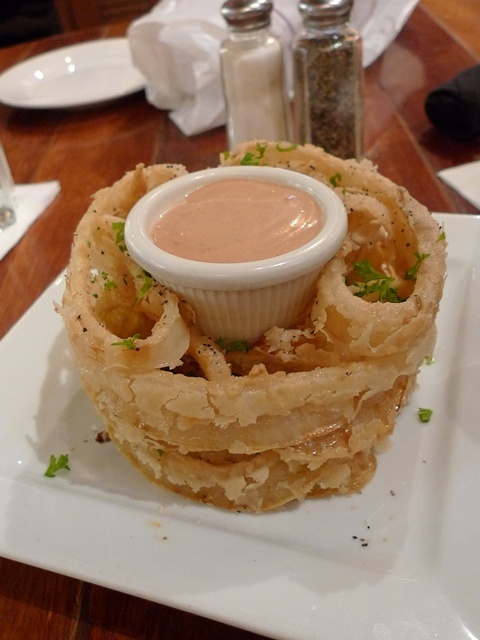 maybe a bit soggy, as i like my onion rings crispier. Criz Lai : looks tempting eh? thenomadGourmand : really that good, the porky one?!! shucks. now i’ve to get myself over to the nort, south or west for taste. NKOTB : hahaha … they could’ve opened a non-halal outlet somewhere in KL. only for pork lovers. Selba : ooohhh.. that sounds attractive enough! BBO : erm, Wednesday not in KL lah. why? got event ah? 🙂 end of the month i’ll be there. i like their whole chicken. I walked past it during my last KL trip and it’s FULL house. Always full house?! I’ve pretty much avoided TR’s after its opening hype all of last year and only hesitantly stepped into the MV outlet when told of the great Happy Hour 1 for 1 cocktail/beer deals. I was rather impressed with the service, the food and blown away by the portion size. The only thing is the furniture’s already starting to wear out, the faux-leather seats torn and taped back together rather haphazardly. Will definitely still go back! Wow..The KL skyline pic is reli cool. Lucky u din regret buying ur cam..
We have been tempted to try their set thing one time or other , but maybe next time and yes the RM18 is a fantastic ride ! Imagine a horny & beautiful Gang of bona fide Gluttons descending on Ipoh Old Town at 9.45 am on a Wednesday morning , say like 6th May 2009 ! foodbin : whole chicken? cooked with? cariso : not really. the Dragon-i, Madam Kwan and Crystal Jade got full 1st b4 Tony's, I'd say. but Pavilion being Pavilion, hordes of tourists and locals like to dine on that level. Sugar Bean : serving size much like TGIF and Chili's. 550ml jar of faith : what? MidValley outlet is rather new, isnt it? 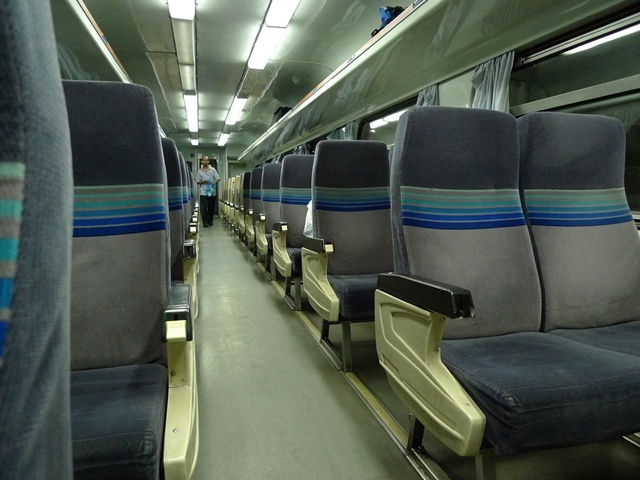 cannot accept if the seats give way so fast! cumi & ciki : 1st visit was forgettable. then one year on, with more outlets now, they're catching up fast. mboy : yeah i guess so. i can finally put my 5610 to rest. 🙂 but not at all times, i'm still actively using the phonecam in some of my posts. BSG : and i can imagine the hawkers in Ipoh shuddering in fear at the thought of gluttons arriving in style, demolishing everything in sight without warning. on a weekday some more. the ribs look good hor? that with the onion loaf is enough to make me happy..
on a different note, anything interesting at the ipoh train station ar? i was thinking, taking the train to ipoh from kl will be a fun excursion. teckiee : mou lah .. far from it. =P i dun eavesdrop one, HONEST! mimid3vils : got one, no worries 🙂 go for the set lunches if you wanna sample their offerings. Nic (KHKL) : ipoh train station? erm, other than some camwhoring oppor, maybe you can walk over to Old Town, which is within walkin distance. oooh, i am soo taking the train up to ipoh the next school hols, with the kids. what fun! I have tried of course the pork rib in singapore and philipiness..taste way better than halal rib..to be frank, I prefer TGI or chillis.